Join us in raising our voices to protest Netanyahu’s speech, not because it’s a partisan snub, nor because the date is close to the Israeli elections, but because Netanyahu is going to Washington to undermine the U.S. strategy of diplomacy with Iran. 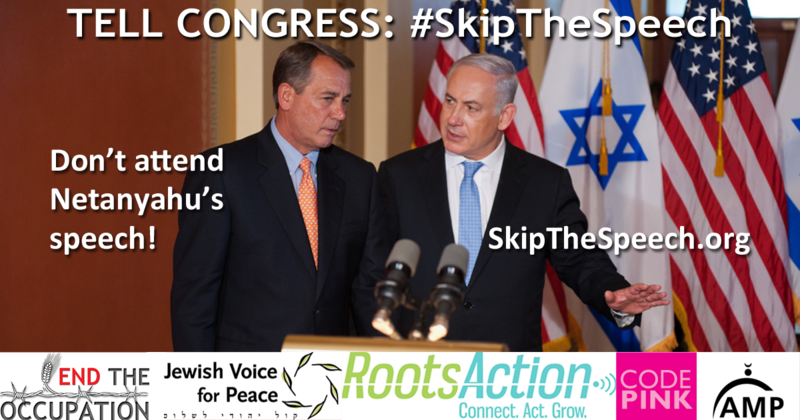 As U.S. voters, we are outraged that Israeli Prime Minister Benjamin Netanyahu was invited to speak before Congress. He will advocate for additional harsh sanctions on Iran that will undermine the diplomatic process and possibly lead to war. Netanyahu does not speak about peace in good faith—illegal settlements and human rights violations against Palestinians have only increased under his leadership. We ask you not to attend Mr. Netanyahu's speech, and to instead stand with us on the side of diplomacy and justice.